The package transited quite quickly from China to Ireland, taking just 4 days. But once in Dublin, it's not yet in your hands...Customs sat on it for 5 days: the time for me to receive by mail a VAT notification from the Tax Office (applied on any import over €22). So the final cost was €90.69 (€69.99 initial price +14.7€ 21% VAT + 6€ bakshish to An Post). On the left, the new FI8918W has a larger and oval base, which is its most visible difference, but also a microphone hole relocated on the base of the camera (just over the logo) instead of the sphere. The troublesome blinking LED has been relocated to the back and replaced with an extra IR LED. On the right now, the rear panel of new FI8918W shows a network light (green), a power light (red) and a MIC input jack. The I/O connector is gone, so no more interfacing external alarm equipment. Update: with the shipping firmware, this settings is not persistent. When powered off, the camera will rotate again. I will inform Foscam of this bug. In the ActiveX interface, the icons that were controlling the relay in the "For Operator" area, are now used to turn off or turn on the IR LEDS, a feature often requested by FI8908W owners! Also, in the "For Visitor" section there is an option to disable the annoying pop up of an Explorer window each time a video is saved. I had a quick look at the FTP settings, but there is still no possibility to set a unique file name or a file-naming loop to limit the quantity of pictures being stored. Foscam is aware of that request so it may come in the future. 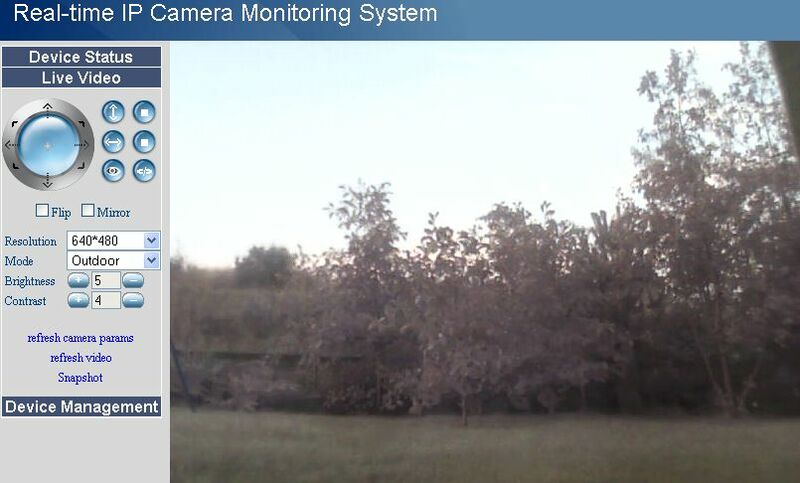 Picture quality: Sorry, the trees are still pink! There's no visible change in the picture quality, especially on the colour rendering. No switchable IR-cut filter. Sound quality: Now we're talking! Something the engineers realized early was the very poor speaker quality of their FI8908W, and they even added a Speaker output jack in the later generations. However the incoming sound quality was also strongly affected by statics, making the dual-audio function useless. This all has changed with the FI8918W, and it is the most remarkable improvement: the speaker output is loud and clear and no more distorted! Also, the incoming sound quality is better*, with less noise probably due to the relocation of the microphone. The connectors for auxiliary microphone and speaker are still a welcome addition but it is now thinkable to use the dual-audio function to chat remotely with people using the embedded equipment. The FI8918W is a clever evolution of the FI8908W. It is priced in the same area. For the moment it comes exclusively branded with Foscam logo, so no bad surprise when purchasing. * Foscam came up with a procedure to boost the microphone sensitivity. Apparently the early FI8918W have this problem. This requires opening the camera (voiding the warranty...) and should be considered only if returning the camera for exchange is not an option. and verified it with /get_misc.cgi. However, camera still centers on reboot or power failure. Seems like the firmware ignores the onstart setting. I've also tried 1, 254, etc... no joy. If you've had better luck, let me know! No firmware updates for these yet that I can find on foscam.com. Hmm, you're right actually.Same thing for me. Thanks for checking on your end, too. I sent a polite email to foscam mentioning the issue. I'm sure they are busy, but if it's a quick fix, they may put something into a future firmware update I suppose. I think these wireless ipcams should include wifi repeater function. Anyone has problem removing camera 6 to 9 in the Multiple Device setting? First of all i think this is a good value for money product! I think i found a bug: The IR night-fission is turned off when first motion detection is detected, even if IR is set to on. I think you're right. I turned off the light and let the motion alarm do its job. When reviewing the pictures, every 3rd picture is dark, so not using the night vision. There is a update available @FOSCAM that will fix this prblem. I can confirm the same IR-LED automatic on/off issue as you have reported. I installed the latest Web UI Version 2.4.18.15 today. However I still have the same problem. IR-LED goes on and off by itself after each record. Could you fix it? Just recognized the function "Restore Factory Settings" and "Reboot Device" are not working anymore with the new Web UI Version 2.4.18.15. After reset (unplug power adapter for a few seconds) this issue was solved. However, IR-LED issue is still the same problem. Indeed the WebUI update (2.4.18.15) didn't fix the issue. Still when motion is detected by the cam IR leds are going off. The FI8908W microphone was an absolute disgrace compared to FI8918W, but I reckon that the sensitivity could be better. However I can have a two-way conversation remotely which was impossible before. There's a bit of static in my case, but far less than with the old model. You should try to put the camera away from other electrical devices, and test it also on its own socket, not on a stripe. It wonder if the quality could improve if plugged to the Ethernet rather than Wireless. Just ideas, I didn't compare these situations yet. Anyone has problem removing camera 6 to 9 in the Multiple Device setting?" Yes, I have the same problem. I had to do a factory reset to get rid of camera 6. Thank you for the information. That is interesting. The Serial number range of the batch would be helpful. Is there a possibilty that your share the PDF-Document? Via E-Mail or download area? if you can forward it to me bubbah@gadgetvictims.com) I'll add it to this post. Can you post that data? I have the same issue and I would like to repair it myself. I've sent a request for that document to Foscam. I sent the pdf to Bubbah but the procedure looks pretty straight forward: if R32 on the PCB is a 47k resistor it needs to be replaced with a 2k resistor. I'm not really into SMD soldering, so I'll probably just solder the 2k resistor on top of the 47k resistor. The other thing Foscam suggests is to change the polarity of the mic connector i.e. cross the red and blue wire. Nor sure what this is supposed to achieve though. Thanks Mike, I update the post above with a link to this document. I'll check my model just in case, I guess that the non-defective cameras would have the documented fix already in place. Does anyone know of a way to embed the video from this camera in to a webpage? There is nothing in the instructions that suggests this is possible and only indicates it can be viewed from the built in web UI. But the 3rd party apps for controlling cameras of this type seem to work and have their own UI so I would think this would be possible. Great to see that now you can use the plastic cover when changing the optic for a better one. In old FI8908 when you change the lens the plastic piece couldn't be used, but now (at least mine) has no glue so its freen to change the lens and use the white cover to put it on again. Thanks, was helpful, but I couldn't get it to wok in my application. I am using an iPhone universal remote app called iRule (check it out at iruleathome.com), it controls all my home theater gear. It also allows the embedding of web pages, I use it successfully to embed Signal server running on my PC to control iTunes throughout my house. Same result. I am able to paste http://ipcam_url/live.htm in to my iPhone Safari browser, it then prompts for username and password, and then works like a charm. Also, are there discrete commands for IR On and Off as well as the Pan? I can use iRule to send these commands and just build my own GUI with it which is the goal in my home automation project. Thanks for any support you can provide, this site has been extremely helpful so far. You will find more/other CGI versions in the internet. Is it possible that a new firmware solves the problem with the microphone low sensitivity? Can someone upload the updated webUI (http://www.foscam.com/down/FI8918%20FI8918W/FI8918%20FI8918W%20sw%20upgrade%20package.rar) on a file sharing service? I can' t in any way download it from foscam.com. to the latest versions available form Foscam. Could you pls show some pictures once you have solved the mic problem? For some strange reason, I cannot get my cam to work wirelessly. I've followed the directions and have tried every combination of encryption with no luck. I'm using an older Linksys WRT54GS router and I'm leaning towards the router as the issue. Can anyone confirm your success using my router model? I've pretty much confirmed that I have a legit FI8918W and have successfully set it up via lan to view remotely online. Just can't get the WiFi up. I have a WRT54GL working perfectly. Just try to configure the router without any security, no wep, no wpa. If it works, try with WPA2/AES. Also be sure to assign an ip, don't use DHCP server. Fro gateway and dns server, use router ip. I have the WRT54GS model. It will not allow me to use the router IP for the gateway and/or dns server. I disabled security and still had the same issue. This router is at least 10 years old and it seems it might be time to upgrade. Shame though; it has been a great router up until this issue. did anyone solve this problem jet ? The IR night-fission is turned off when first motion detection is detected, even if IR is set to on. >Yes,there is a bug in the software. >Our engineers are fixed that now,they are testing the new firmware on our cameras now. >We will release it as soon as possible when test pass.Then load it to our website for users to upgrade. I have changed the polarity of the mic and it improves the audio level enough to hear, not too loud but enough. I'm not prepared to do a solding the 2k resistor, maybe I'll try if somebody explains the results. Wireless SSID Broadcast is/was enabled. The issue remains. Do you think it is the router or the cam unit itself? I have a pretty old router myself (Linksys WAG200G) and the camera works fine with it. Thanks for the info. I am sending the FI8918W back for a full refund. I purchased it through Amazon.com and I'm wary about its authenticity. The box, stickers on the camera and the UI all match perfectly to a real FOSCAM but this issue leaves me to believe otherwise. Better to be safe than sorry. Thanks to all that chimed in with their $0.02. Great community here! Hey guy, we know if this model are avaliable in DX? and what the sku. I see that Foscam have released a new software upgrade package for the FI8918W today. I am travelling this week so cannot confirm whether the issues are fixed myself in my own camera. The readme of the firmware package is below. Pls make sure that your camera is FI8918W,not FI8908W.They are two different kinds of camera. The firmware is for FI8918W,if you upgrade the firmware wronly for FI8908W. Your FI8908W must be crashed and need send to repair. 1)Restore the bug that IR lights will turn on/off when motion trigger. 2)Add option to set preset position for the camera or diable preset. I updated the firmware. Unfortunately the IR bug is still there. I didn' t test the preset position. No more link today. They probably realized the fw was not ready for release. Hello to everyone from France! Are you able to connect the new camera[b] FI8918W [/b] to a wireless network on [b]channel 12 or channel 13 [/b]? I am forced to switch to channel 11 for the FI8918W found my wireless network. and work perfectly in that configuration ! I picked up a couple of 2.1mm 160-Degree Wide Angle Lens to replace the, er, weak lenses in my Foscam FI8918W. Anybody know the proper procedure for doing so? Just unscrew it from the cam,and crew the new one.My cam had the white round frame with no glue, so I just pull it out and unscrew the lens. Then while you crew the new one, keep the cam on so you can see if it shows a clear image or not, crew the lens until the image is good. The last update for the fi8918w solved the IR problem. with this update its a very good camera. Im trying to use this cameras in Zoneminder. At first it worked under the videostream.cgi?user=admin&pwd= .. but now it wont load. Dont know why in explorer it tries to download something when i try accessing it, but in chrome and firefox it will load correctly. Is this a firmware fail? How can I fix this and acomplish to monitor the cameras under Zoneminder? guys, just to confirm that I fixed the volume problem by soldering a 2k resistor over the 47k resistor. The thing is really tiny and I neither have the tools or skills so it looks messy, but the volume is OK now. Sound quality is still very average. This is really strange... The cam works fine on ethernet, but I can't find any wireless networks. I worked once, but now (even after the latest firmware upgrade) I never see any wireless networks when I click 'scan'. Does anyone know a solution to this problem? the 2° cam scan correctly the SSID but when i complet correctly all fields ( wep, keywep ...) i press submit button, i unplugge the LAn and then nothing ! Upgraded to latest firmware lr_cmos_11_22_2_30.bin and 2.4.18.15.004.bin. I found that certain symbols in the Share Key are not accepted. These include # & % and + althought there may be more. Why do you have to have your router's SSID visible? 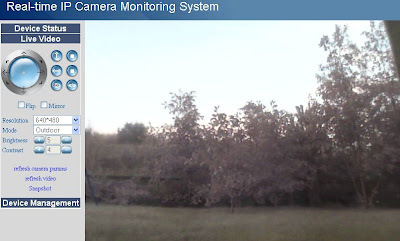 @Andy this is what I did to view in a browser with a Dlink cam. I disabled user access controls in the cam's setup utility and then accessed the cam in a browser window outside my network. For people who have issues with wireless connection, in my case I had to set it with Internet Explorer to make it work. With firefox it simply did not connect. For me the biggest drawback of this "security" camera is that the camera itself does not support any sort of security! No https support, no email alert for email accounts with SSL/TLS connections (gmail for example) and no SFTP ability (plain-old-easy-to-sniff-the-password FTP only). It beats me why they don't support any of these above. Also, Center button on the web gui results in camera pointing to sky and pan from left to right and right to left aimlessly, stopping whenever it feels like, showing the ceiling. I use a the Surveillance Station of a Synology DiskStation as a workaround. It's a NAS with an IP Camera client that can works over HTTPS. or, if you use the preset, make sure you defined them. Thanks Bubbah, apparently even though my Web GUI showed the latest version, I still needed to upgrade the GUI as well. 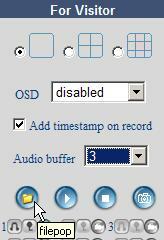 After that disable/enable preset buttons showed up on the GUI. Now if we can only open/mount the firmware image properly, adding SFTP would be fairly easy. Anyway, I simply connect to it through my home made vpn server (openvpn running on a dd-wrt loaded wireless router). Also, does anyone have problems with foscam dropping from wireless, or actually losing it's IP address while staying connected? then you need to setup the dydns url's for each camera under the multi-device setup. If you only specify the inernal IP, it will not go through. 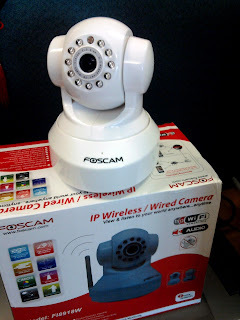 See "FAQ for IP Cameras" and Foscam manual. I want to add a small external mic & speaker but can't find the ohms for either in the spec. Anyone know what to buy? Thanks, great forum! serverleader, I have the exact same config. actually (dd-wrt router with wpa2-personal). Couldn't find a solution so far. I had the wpa2-personal problem as well, the fix was to shorten the key. Hi, I just bought one of these cameras. I purchased it from a reseller that is listed on the Foscam site as an official reseller, but now I'm worried. I see the post on this site about how to distinguish the real and counterfeit FI8908w. But I don't see anything about the FI8918W. Is the information the same? If not, is there any way to distinguish real from counterfeit? I don't think there are clones of this new model yet. You could still contact foscam.com and send them your Device ID (from the Device Status screen). They'd tell you for sure. We had trouble getting the camera to work wirelessly, then discovered that the encryption key we have on our router is too long (it was insanely long). When we changed the encryption key, it worked perfectly. I've updated the "Faq for Ip cameras" with this information. I thought I posted that already some time ago but could not retrieve it, so this is done now. I want to order some Foscam Products from reseller in Chine (goodluckbuy). How can use Cam in Europe? Do the Cameras come with European 220V Power Adapter? Do they a European Power Plug? Normally these eBay shops provide the adaptor suitable for your country but you should check with the seller directly. 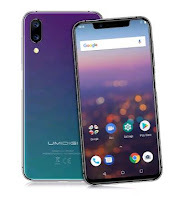 Considering the shipping and possible VAT if intercepted by the customs, you may want to consider the few extra buck to buy from a reseller within EU. Also a good idea if you ever need to ship it back. Hi all. I just got two of the FI8918W bad boys. Everything is setup correctly but I can't seem to listen to or hear sound. I see there is an input and output on the back, but I assume that is if you want to connect to a better mic or larger speaker. What am I doing wrong? There's a faq on this blog giving the details. I try the upper writes. Regarding foscam cameras dropping their connection to WIFI routers, I've found the router is most likely the issue in my case... swiched from a cheap pre-n router back to a cheap 802.11G router and it hasn't dropped since. in regards to the comment about the " possibility to set a unique file name or a file-naming loop to limit the quantity of pictures being stored." I solved this by creating a VBS script that will move the pictures taken by day to a new folder every day. the folder is created automatically with the format mm-dd-yyyy, in this way you can keep a backup of your images sorted by day. you can keep them as long as you want, depending on your storage capacity. Are you able to turn off the actual base mic for an external mic only? Saw the comment above about lack of security. Has this been changed at all with recent firmwares? nope, despite them saying they're working on it, I don't believe we'll see encrypted access anytime soon on a device of this price range. I'm only getting 1-2 fps and this is with the came sitting ON TOP or the wireless router. Pure junk. I bought 2 of these and love them (the new ones). Very powerful, especially for the $90. But I have an issue that I am unaware how to fix. I have a camera with the latest firmware and web-ware installed (the version that supports gmail) and it's at a cabin in the mountains with wifi (and no computer on the network). I can view it remotely, control it, etc. But when it detects motion, it doesn't send an email with the attachment image. I know the email is setup correctly because I get the test emails and the 'ip address' emails when it boots up. I have all the motion stuff correct (it detects motion and records video on the viewing computer). I don't get an 'alarm' notice emailed at all. Does there have to be a computer in the network with the camera in order for it to send images? The other one I have seems to work okay, but there are computers within the network of the camera. I don't have that problem but only use non-TLS smtp because my FI8918W is an early hardware platform and does not support encryption. Maybe you should test to see if non-TLS on port 25 works better. you can use "gmail-smtp-in.l.google.com" as SMTP server. Always check your Spam inbox as well just in case. I will try that. So just to be clear on my understanding of the camera and how it works...there shouldn't have to be any computer on and 'inside the network' with the camera that is needed to capture the video, create images and email them out? the camera is a stand alone server that should be able to send all that out by itself? When I used the gmail-smtp-in.l.google.com settings and 'no authentication needed' and port 25, the test said 'successful', but the email never came in. When I put it back to the smtp.gmail.com port 465 and TLS settings, the test email went through, but still not getting alarm messages. I'm sending the emails from a gmail to the same gmail account...so it's all 'within' gmail. The sender can actually be any fantasist email of your invention. I know use it like "LivingRoom@home.ie" even though no such address really exists. It will appear as "Living Room" in your inbox. Other tests you could try: send to another non-gmail email account, try another free SMTP server (most ISP have one that doesn't reauire authentication). Try the upload to FTP aciton to see if the problem is confined to the email only...but first check the Spam box! It's like the failure is between the camera and the internet when sending pictures/motion alarm notices. If I am accessing/watching the camera from a remote location, I can do 'test emails' and get them to Gmail. When I reboot the camera, I get the url email. I check the 'sent' folder and the test emails and URL emails are in the 'sent'. I then trigger the motion alarm...the camera records video to the computer I am watching from, does the 'alarm' thing, but never sends a pic/alarm email...even though those are checked off in the alarm settings. This is frusturating. I also have Charter emails, but when I try to do the settings for charter, it can never connect to the server....thought gmail would be best. The emails aren't ending up in Spam for gmail....checked. But that was a good recommendation....thanks for that. I have a New FI8918W in a dome, everytime it reboots the IR light turns on, and the camera moves all over. Is there a way to disble the IR light and stop the movement after a reboot? preset" and clear the "Go center on boot" options in PTZ settings, or issue /set_misc.cgi?ptz_center_onstart=0 as part of the url. but I'm not sure this one remains set after a reboot. Okay, so I had the problem of it not sending alarm emails (but it was sending the test emails and boot up emails). I got ahold of Foscam tech support here in the US (took many emails to get to this point). The problem was that I had checked 'upload images on alarm' thinking that was how we would send an image with an email...but I guess that is for FTP uploads and over rides the email setting. Once I 'unchecked' the upload image on alarm..the emails started going through WITH the alarm images. HI all, extremely helpful thread here. Just installed one of two new 18918's, and all went well except for one issue - the audio is horrendous! Loud, scratchy, garbled, you can't hear anything. It's terrible. Any suggestions? Thought maybe it was some kind of static issue, so moved the camera, but no matter where it goes it's got that horrendously loud crap coming out of it. Any solution to connect on channel 13? this new mode only let you use channel from 1 to 11. I was considering purchasing one of these to use as a baby monitor as I don't want to fork out another £100+ on a dedicated video baby monitor solution. I am competent in IT so set up should be fine, but my concerns are around the audio quality. How good is it ? Sound on old FI8908 was terrible, now with FI8918 it's "better" but not great. As far as I can tell, this is quite the case for most other low cost IP cameras. At least this one allows to plug a external microphone (and speaker)which I would recommend in your case. Also have a look at the post on "3rd party applications" as there is an app dedicated on baby monitoring using ip cam. Video wise it is great as a baby monitor, but the microphone not even slightly comparable to dedicated baby monitor mics. I am using it with a voice only baby monitor. It has an external mic input but I did not try it. That's a shame. Bad audio quality would be a deal breaker for what I would want to use it for. I may have to just bite the bullet and buy a 2nd video baby monitor (#2 baby on the way). hi...i need to have a zoom lens on this camera...i cant mount it close enough to my fish tank to make it worthwhile viewing at the moment .... does anybody know what lens i should buy (i realise that it wont be remote controllable...that would be marvellous though!!). please let me know! sell them. im trying the 8mm - i will let you know how it is. @ Delafontay it seems to be hit or miss on the audio, I have one with exceptional audio quality and one that I can't hear a thing over it, it's all noise. Can't get anyone at Foscam to answer my questions regarding the unit and if I could do a firmware reset or something to try and clear that up. While the camera seems great for the price, the problem with the wifi seems to be rampant. I have the 8918W and it simply will NOT connect to either wifi routers. I'm very IT savvy and nothing I do works. To add insult to injury, I bought the device off of Amazon. When I called Foscam for support, the guy said I could pay $50 and have support and install (nearly as much as I paid for the camera). If I didn't want to do that, then I shouldn't have bought it from Amazon and that I should call them for support. That's what I call a quality company! Not only that, but their support line is a Skype number. Thanks for the pointers, Bubbah. Unfortunately I had checked that FAQ and none of those apply. I can see any SSIDs after upgrading to the latest firmware. My SSID is dlink and I've tried every channel. Also, the password has no special characters. I've even turned off security and that didn't work. I'm at a total loss. I used to have problems with the WiFi not connecting (using a TKIP+AES encryption type). Since swapping from DHCP to a fixed IP, I've not seen the problem any more - it seemed like DHCP was actually the problem, rather than the wireless. I never confirmed this by checking the DHCP logs, but maybe worth a try if you're having similar problems. I had the same problem regarding email on alert......what i realized after going through dozens of comments on how its a firmware problem etc etc was that you DO NOT enable upload image on alarm.....that setting is to send an image via ftp to the internet! disable upload image on alert and it works. why why why do companies have to make something simple sooo complicated. An ActiveX interface is mentioned in the article above. Does this mean that remote pan/tilt/etc support is only available on IE? Or is there an alternative interface support for Firefox or Chrome on Mac or Linux? I'm thinking of getting a pair of these. My requirements are to be able to remotely monitor/control the cameras via browser & iPhone app. There's an alternative interface for non-IE browsers and it has P&T controls, but like for most IP cameras, not all the functions are in there. For smartphones, the IP Camera Viewer from Hit-mob is simply the best. I have FI8918W (the white model) and all in all I am satisfied. I found a problem though. I gave my cam a static IP and I access it remotely just fine, in fact I redirect a simple domain name to the dynamic dns of the cam, so my partner can easily monitor it. At home I have a wireless A/P (TP-LINK) connected to a switch where I plug in the modem/router (DLINK) and other devices (eg. Raspberry pi - yummy!) on my LAN. Now I cycled the power to the access point to test how robust my setup is, but although other devices in the house all reconnect - the Foscam doesn't. In fact I need to reboot the cam - catch 22 if I were remote. What is up with that? Did I miss something? Am I doing something wrong? Is there something I should be doing?